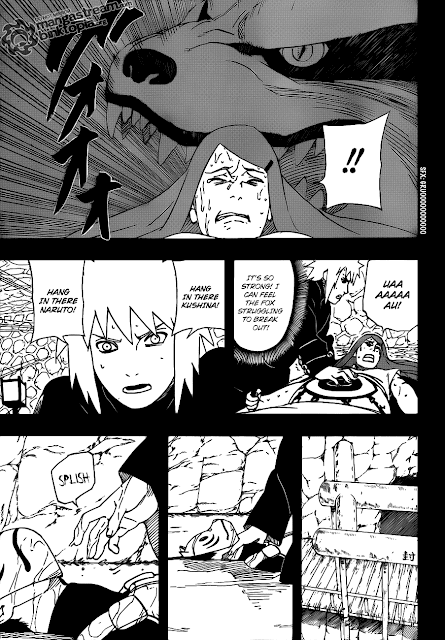 Naruto Manga 500 Scans in English are OUT NOW -- courtesy of MangaStream! UPDATE: We now have the CONFIRMED SPOILER! 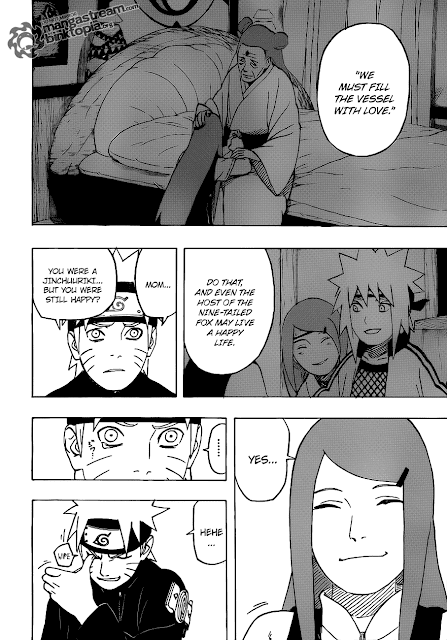 Revealing that she was jinchuriki, Kushina goes into the story. She tells that she was chosen to be the second jinchuriki and taken to konoha. Naruto is furious as to why his mum from another country had to be a jinchuriki. Although different countries, hi no kuni(the country of fire) and uzu no kuni (the country of whirl) had an intimate relationship and the senju clan and the uzumaki clan from uzu shio were distantly related by blood. Having many peeps with strong life force uzushio country was also called the land of longevity and there was a rather rough clan that was good at fuin jyutus. The 4 sho fuin on naruto was originally based on a jyutsu of uzu no kuni and who taught it to minato was me— says kushina. The mark on the back of the costume konoha shinobis wear is the mark of uzu no kuni, adapted as the sign of amity between the two nations. It was a country feared for the fuuin techniques, marked, and destroyed. 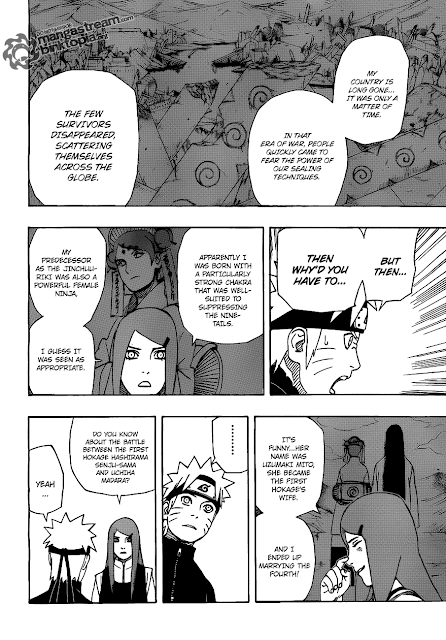 The holdovers have disguised the identity and been scattered–Kushina continues. “But but why it had to be mum?” asks naruto. 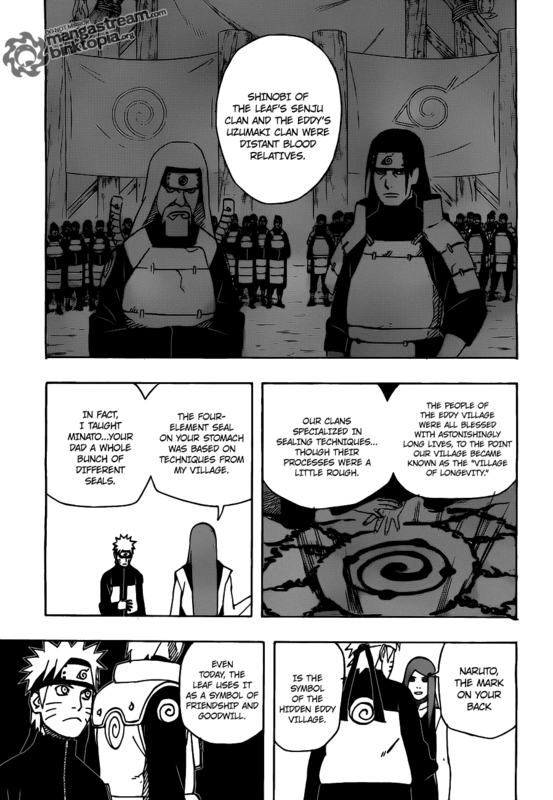 After asking naruto if he heard of the battle between hashirama and madara, kushina tells naruto that mito sealed 9b inside of herself with a fuin jyutsu and became a jinchuriki to reinforce hashirama who’d gained 9b after the battle. Kushina continues that she was brought in as a new container when mitos days were numbered. “then u were treated like some bloody object(/tool)!” naruto’s enraged. Kushina replies that she herself didn’t know when she came to konoha and was shocked to hear that too. It was a top secret only several higher-ups including the third knew. Even the 3 nins were out of the loop. “But when i was almost crushed down by the pressure and loneliness, mito kindly told me this…” says kushina. For the last line, Naruto cant help but sheds tears. 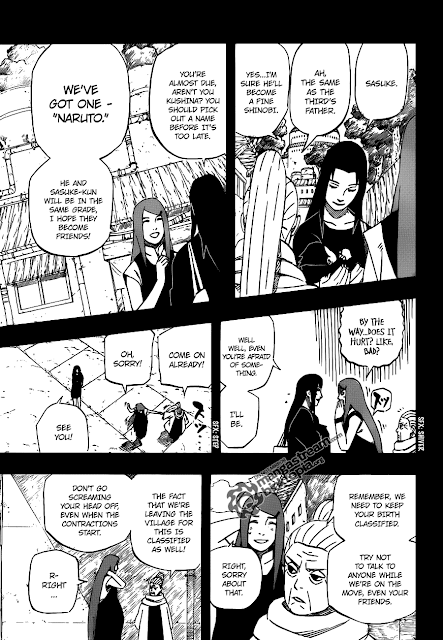 “so, minato didn’t have time(to tell you) did he?’ understanding that minato didn’t get to tell naruto the details, kushina starts to tell naruto about it too. During the 10 months (of pregnancy) from the conception to the delivery, the energy of seal shifts to the baby and in proportion to that, the seal itself gets weak. —the flashback of the 10th of October, 16 yrs ago. In minatos home. 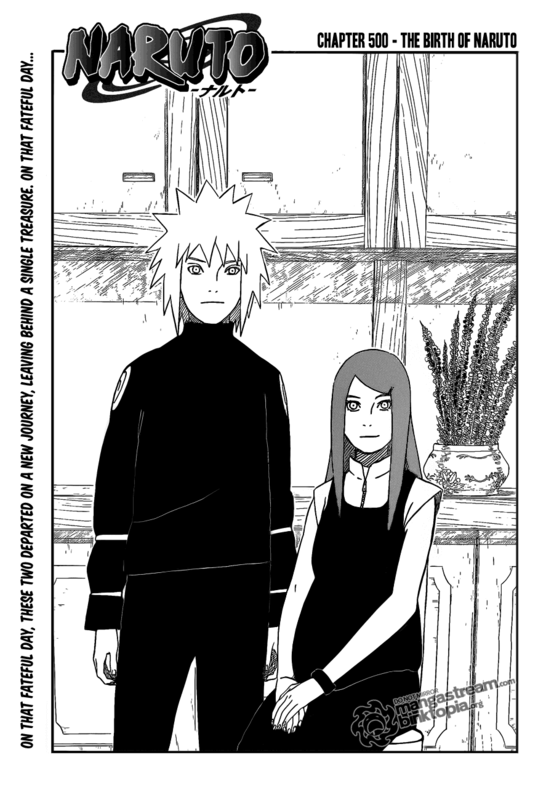 Minato, kushina, the third? and his wife Biwako are talking on the birth. The third says kushina is to give birth in a kekkai (a cell shield with seals. Something like magic square) at a distance from the village, just in case and will be accompanied by minato, Biwako and Taji from anbu. The guards will also be assigned from anbu, under the direct control of the 3rd. 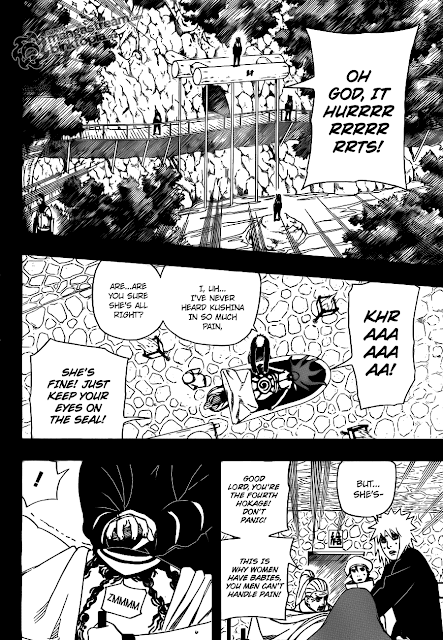 Biwako says shell show her the place, and she and kushina get moving. On the way they bump into Mikoto with sasuke in her arms. the name sasuke is same as taht of the thirds father. ‘its after the namesake, to be a great, strong shinobi.’ says Mikoto. In the cave where the kekkai is, kushinas delivery starts. 9b struggles to break loose and gets suppressed by Minato with his fuin jyutsu. In the outside a man in a hooded black coat has done away with the guards and slips through the wall to go inside of the cave. “Narutoo, come out quickieeee! 9b u stay thereee!” says minato. Soon Naruto gives a first cry. As the delivery’s done safe and sound, minato cries that hes a father from the day on. Kushinas also delighted to finally see the baby. Minato tells her to hurry up to restrain 9b. But then Biwako and Taji give screams and fall. There’s that man in a black hood holding naruto tells minato to leave 9b, otherwise the babys life is gonna end in a minute. Baby Naruto is being carried. The childbirth was kept an absolute secret. Mikoto was accompanied by an infant (Sasuke), and in front of Kushina were two friends. 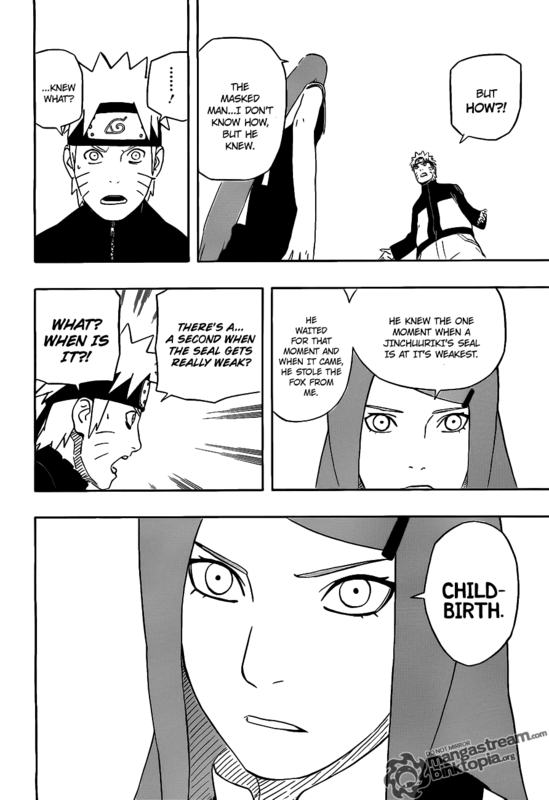 Kushina, like with Mikoto, the childbirth will be painful, according to one of the women. As the child came forth, the Kyuubi probably came out (the seal weakened) that’s why Mikoto also witnessed it. Several Anbu members were on standby in front of the room. Date of birth: October 10. The seal weakens. Minato [tries] to strengthen it. A masked ANBU takes the infant (Naruto). Naruto’s birth was carried out in secret. 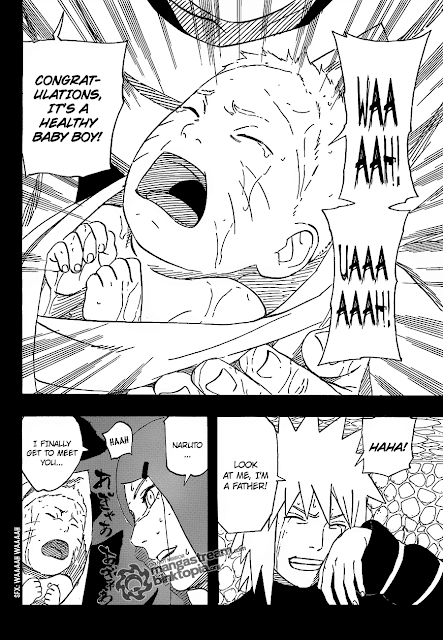 allowed to bring baby Sasuke to where Naruto was to be born. Mikota and Kushina have a woman’s conversation (About the pain of birth). 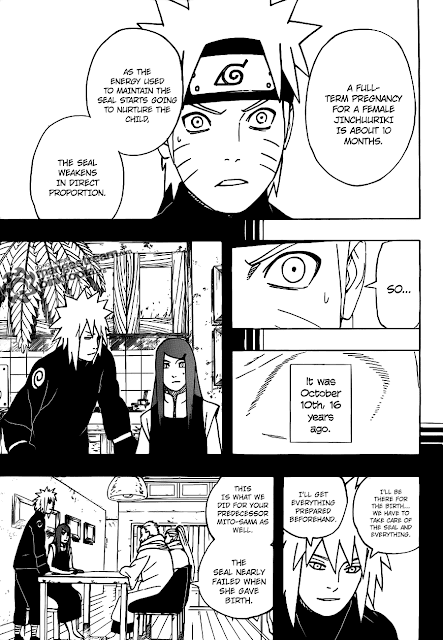 At the time of birth, the Kyuubi threatens to escape fro Kushina (due to the weakening of the seal), so Minato makes an appearance. Kushina was in great pain, and Anbu stand by (on alert) right outside the room. Naruto was born on October 10th. The seal was greatly weakened, so Minata attempted to fix it. Baby Naruto is taken by a masked Anbu; seperated from his parents, otherwise he will be the next human sacrifice. 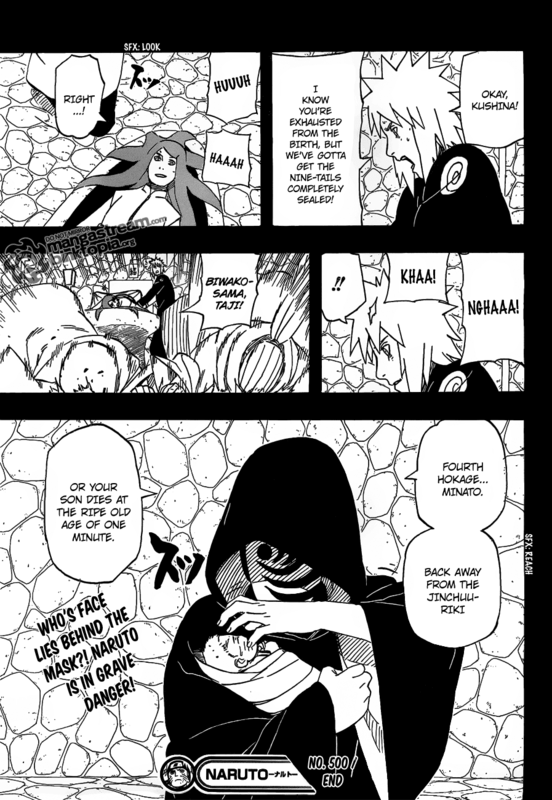 Why did Kushina become a human sacrifice? It seems that Whirlpool country (Hidden Village of the Whirling tides) clanspeople were masters of the sealing technique. The First Hokage’s wife MIto was also a human sacrifice. Mito was the first human sacrifice. By dying, Kushina became one. Kushina died, with Naruto being the 3rd. Naruto’s Jersey’s back design is the swirl of the Whirlpool country (Whirling Tides’ Mark). Now, that sealing jutsu, the special chakra is aimed at being destroyed. 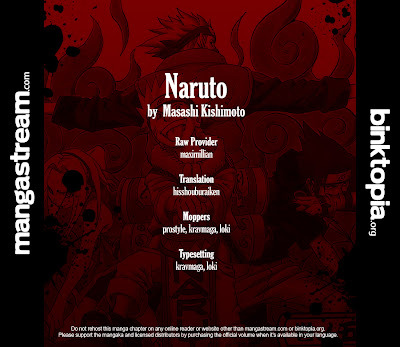 Read Naruto Manga 499 via the link. 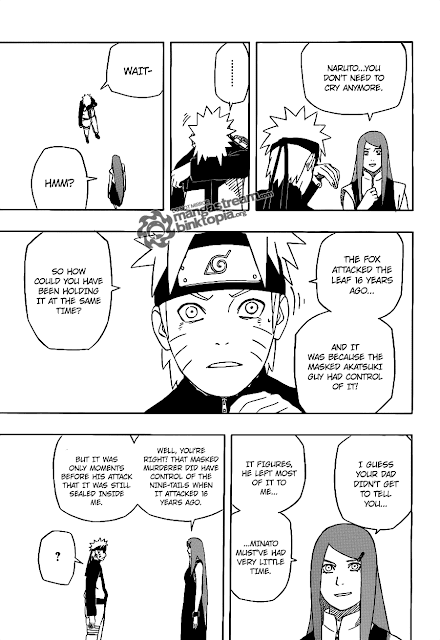 Kushina: Naruto, I was the previous 9 tails Jinchuuriki. Naruto: What do you mean? 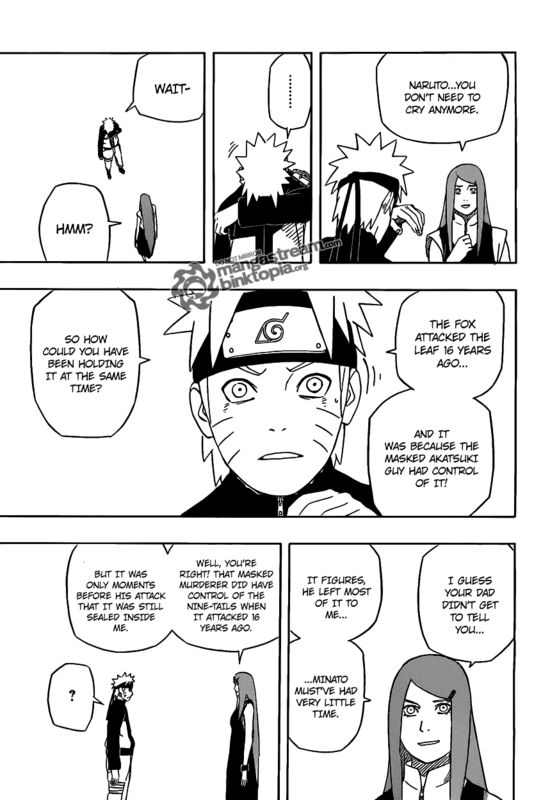 Kushina: 16 years ago, after you were born, Madara and Akatsuki captured me to try to get the Kyuubi from me and extract it. They succeeded, but I let the Kyuubi take me over, and I died. Luckily, My chakra was still mixed in with the Kyuubi’s chakra, that’s how I’m able to talk to you. Naruto: Did Dad know that? 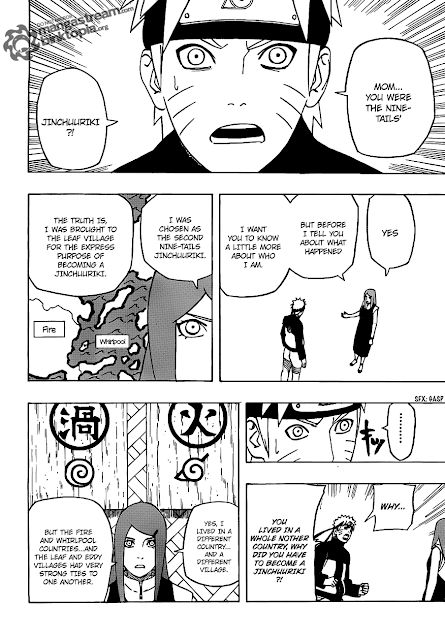 Kushina: Your father was VERY intelligent. He knew my chakra would still be mixed with the Kyuubi’s chakra, and that’s when he decided to seal the Kyuubi into you in hopes that you would one day control it to finish a very special jutsu. 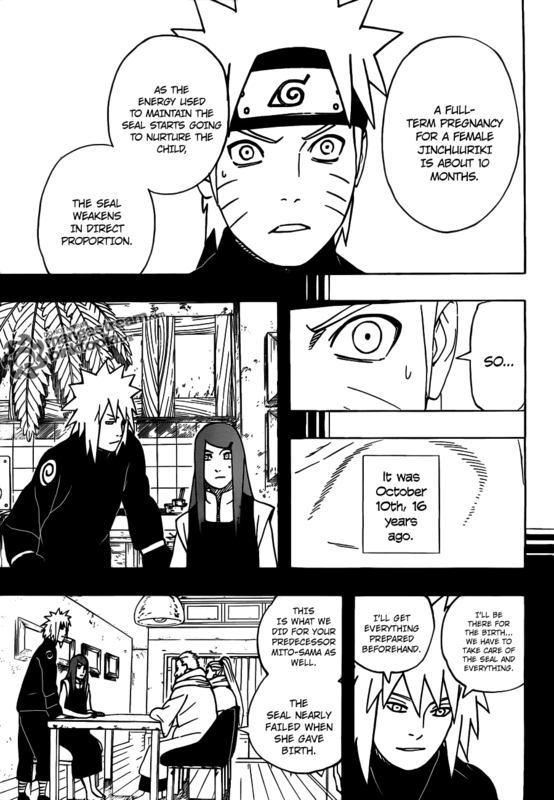 Kushina: Minato said you would figure it out whether you had the Kyuubi sealed into you or not. *smiles* That’s how much he believed in you, Naruto! Naruto: I WILL figure it out. Kushina: I’m sorry Naruto, I wish we could have more time together. My chakra is almost gone. 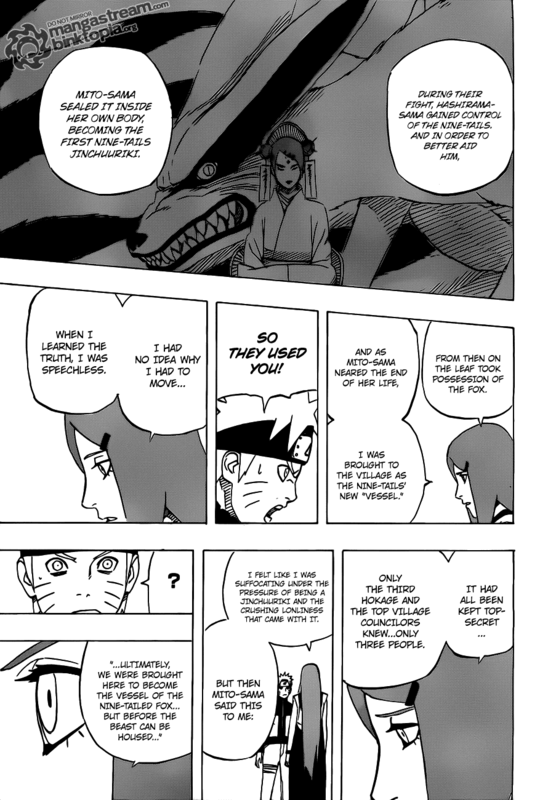 I’m so glad I could help you control the Kyuubi, but remember it was YOU who did it! I wish the best for you, Naruto. I love you. Naruto: I love you too Mom! Naruto opens his eyes and stands up. 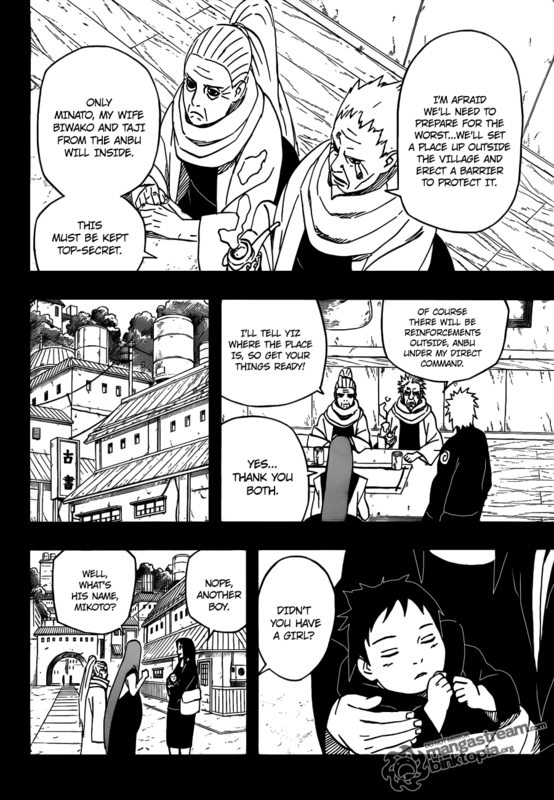 Killer Bee: Yo, So I’m guessing you and the Kyuubi are partners now like me and Hachibi? Naruto: Yeah, exactly. I met my mother, as well. 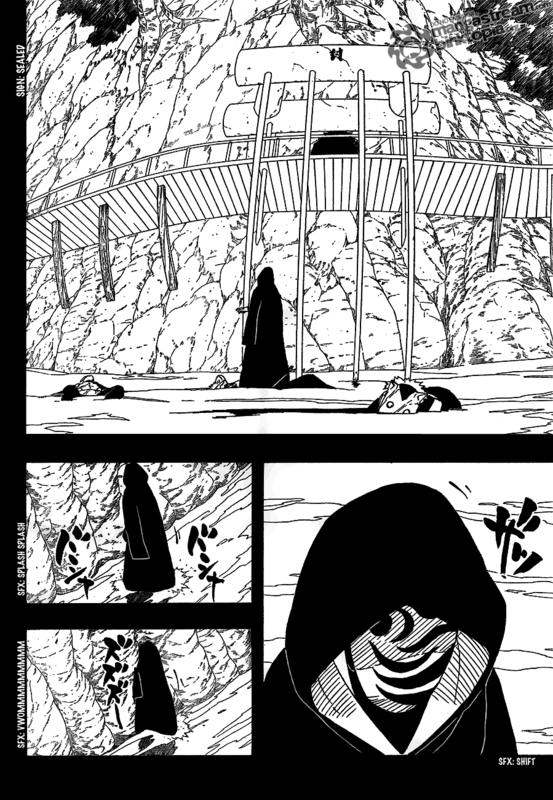 She had a special chakra that could chain the Kyuubi down so I could separate the Kyuubi’s chakra. When I used the key to seal the Kyuubi, my body was surrounded by chakra with weird designs, and the Kyuubi said something about it being the Sage of the Six Paths? Yamato: Wow I thought that legend was false…. Killer Bee: Well, that doesn’t matter now. We got a Jinchuuriki alliance here. Samehada rattles on KB’s back. Killer Bee: Damn, this sword likes me! Kisame: I don’t like you, it’s my job to capture you, HACHIBI! The Kyuubi is here too, so this must be my lucky day! Killer Bee: Yo, who the hell are you?! Kisame: Why do you want to know? It will be useless to know the name of the person who captured you and killed you. Killer Bee: There’s no way you’ll stand a chance against me and Naruto both. Naruto: Killer Bee is right, DATTEBAYO! Killer Bee: Let’s do this Naruto. Both transform into their bijuu. Madara: Sasuke, have you gotten used to these eyes yet? You’ll thank me later. Sasuke: I don’t need to thank you. I need to thank Itachi. Madara: There’s something important I need to tell you Sasuke. I have let Kabuto join Akatsuki for his own purposes. If I didn’t do that, all of my plans would be ruined. Sasuke: Is he after me? Madara: I know you can defeat him after we use his power, Sasuke. He can frame me at any time, plus he has surpassed Orochimaru. He has perfected the Edo Tensei no Jutsu. Sasuke: Alright. I see how it is. I know how Kabuto works, plus with my new eyes, I can definitely defeat him. HAHAHAHAHAHA! Madara: You grow more evil each second. Wow...another spoiler like this and the manga will be over LOL... That's going waaay too fast. i agree...its just a prediction and it was very short. 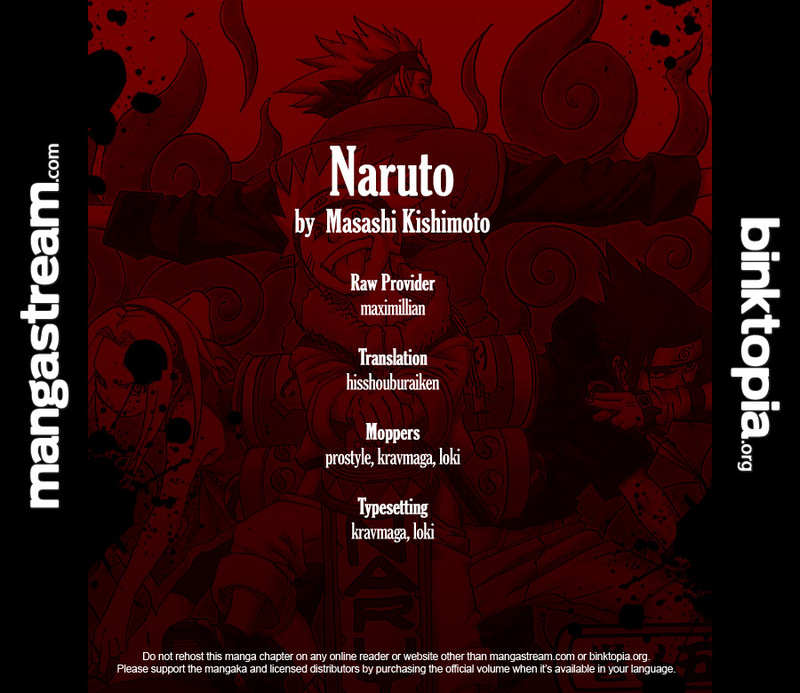 seems like naruto gets near to the end... hope it is continuous... no end.. heje...! LOL! its now licensed, some manga sites already removed it from their sites. that sounds a lot like him.